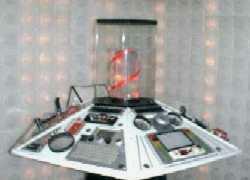 How to Build a Dr. Who TARDIS Console! Dr. Who is a Timelord, a renegade member of that ancient, time-traveling alien race, who just happens to think that his people should be out in the universe fighting Evil, instead of home on Gallifrey watching Eternity decay. His timeship, the TARDIS, was stolen (sorry, "borrowed") from Gallifrey eons ago by the rebellious Doctor, and is a creaking but lovable mess. The ship's "Chameleon circuit" is damaged, so the ship that was once built to blend innocently into the local environment of whatever planet it lands on is now forever frozen into the shape of a 1960's British Police callbox. Ten actors have played the Doctor over the lifespan of the TV show and in the movies. It is said you always prefer the first Doctor you saw, and for me, my favorite was the show's most prominent version, Tom Baker. Clad in that long, floppy scarf and goofy hat, and with that lovable toothy grin, he will always be the Doctor to me. 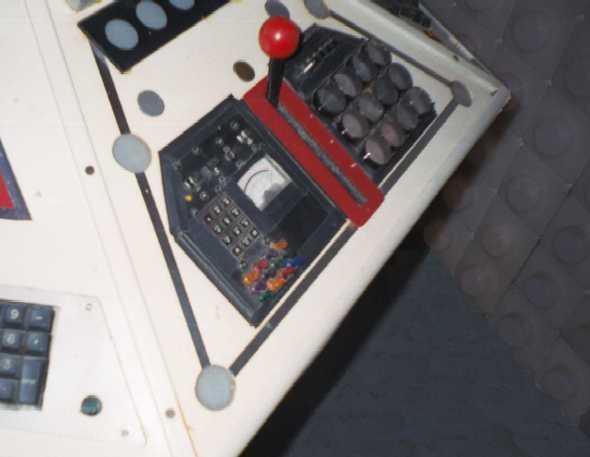 So it is understandable that my Console was based on the "Baker configuration" that was used during his stint on the show. Today, reference materials are only a Dogpile search away, but back then, all I had was some official Who book printed by the BBC and endless hours of video tapes of the Baker episodes. 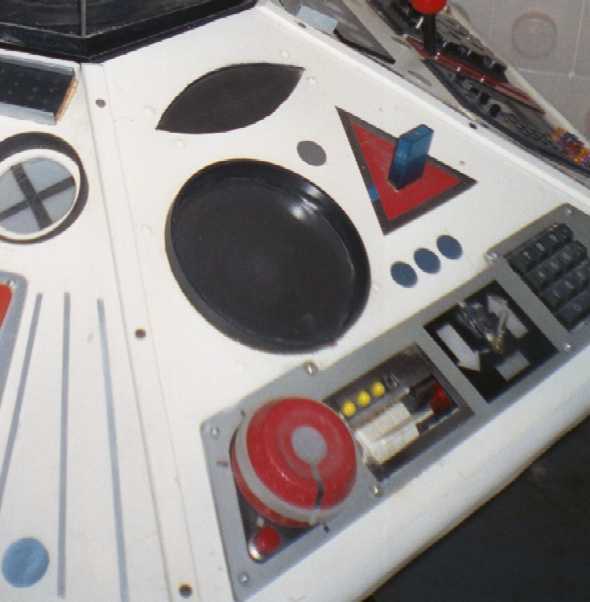 The original goal of the Console project was actually to make a wargaming prop for the Dr. Who Roleplaying Game, with the intent of making gamers demonstrate exactly what controls they were setting to cause effects in the game. With my wild interest in anything that blinks and beeps, the project took on a life of its own. 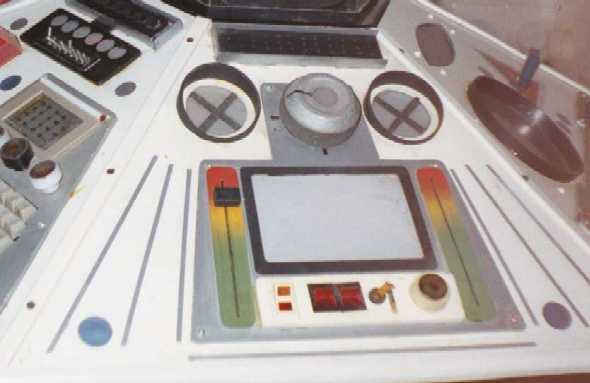 The TARDIS Console is about 48" wide, and the main table without base or Time Rotor is 12" tall, which made it just fit the back of my old Horizon hatchback. The support surface of the Console is a six-sided polygon of 3/4" plywood. I built a raised center section slightly larger than the Time Rotor casing in the center of the table, and used matching plywood to make six sloped fins radiating out from the center of the device. These fins support the six cover panels, which were cut from 1/8" thick laminated bathroom paneling and painted white. The hardest part of the design lay in the Time Rotor mechanism. 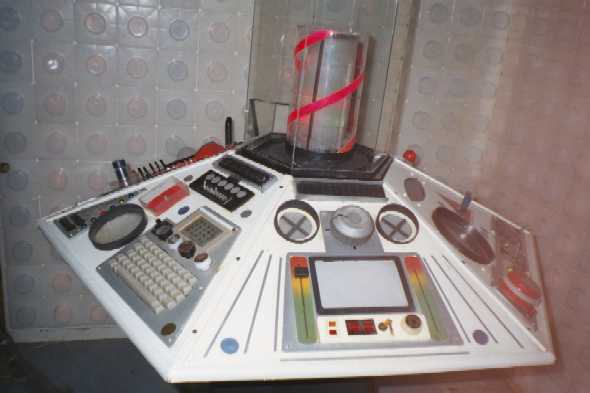 The original TARDIS (Type 40, purists will remind you) was built to oscillate up and down per the moving display to your right, but that kind of machinery was far beyond the means of my poor workshop. I solicited advice from a dozen engineers where I worked, and the results were beyond bizarre. "Compressed air!" one insisted. "Nonsense! Hydraulic piston!" another replied. 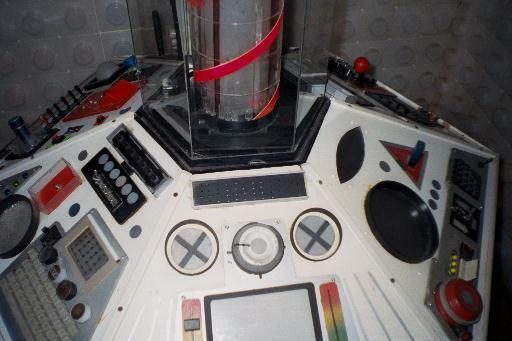 In the end, sad to say, my only hope to conquer the engineering problem was to use a Plot Device; this TARDIS was an experimental Type 39-X, and the Time Rotor would have to really rotate, rather than go up and down. The exterior shell of the Rotor is a hexagonal terrarium, donated by my gaming friend. The next layer in is a cylinder built from 6" diameter plastic rings, rescued from the scrap bin of a local plastics store. I glued them together in a 12" column and attached them to a ball bearing turntable in a sort of flashy "top hat" format, and added some dayglow red stripes to highlight the Rotor. This "top hat" spins around, driven by the tiny 120 volt motor from an electric razor. 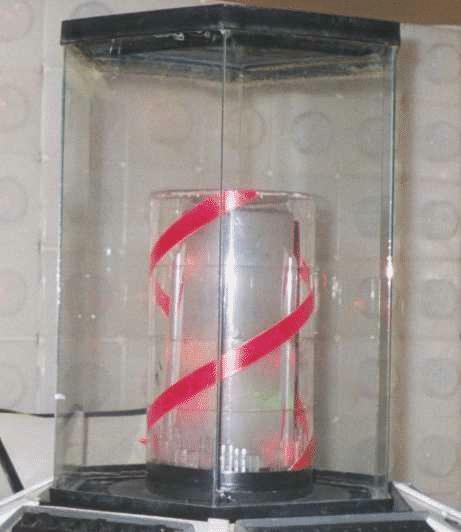 The innermost gizmo is a cylindrical plastic aquarium, sanded lightly to make it diffuse light. I added some crystal rods from some junked Spencer Gifts toy logic puzzle and some red vertical fins from the scrap plastic bin, and lit it from the inside with a string of large Christmas tree lights. When I began the Console, like any cinematic props department, I began to look for free odds and ends that could look flashy and impressive. Some major-league scavenging and some kind donations gave me all I needed. Incorporated into the Console are such oddities as a Radio Shack voltmeter, a junked car clock, wooden core pieces from 36" printing rolls, clear and colored thumbtacks, and even the plastic shipping box from a children's' travel game. A Leggs' clear plastic egg provides the display dome for the Celestial Beacon, and an Equal tablet pocket carrier serves as the Emergency warning device. (The keenest-eyed of those viewing this may recognize that the Dimensional Stabilizer is, in fact, the plastic case from an Early Pregnancy Test!) You may also note that the main drive switch is that oddball lit rocker switch from a Mr. Coffee machine! The electronic guts of the beast were scavenged from far and wide. The original powerplant that drives all the 5V+ and 12V+ devices under the hood was from an Adam Computer (ask your Dad, kids!) and several strings of Christmas tree lights provide the flashing, blinking glow. I built some simple LED pacing circuits to provide some motion on the panels. I also found a cool gadget at Wal-Mart; they make a tiny device that flashes ten LED's randomly that is used to light "Christmas Tree" sweatshirts. At the time, the flasher was about $4.95 and I bought a dozen to be used in the TARDIS and other projects. "Grab bags" from Radio Shack and other electronics houses provided me with dozens of switches and lights, and the rest is history. Ultimately, I wired a Atari 400 computer and floppy drive into the system, outputting through a small black-and-white TV. 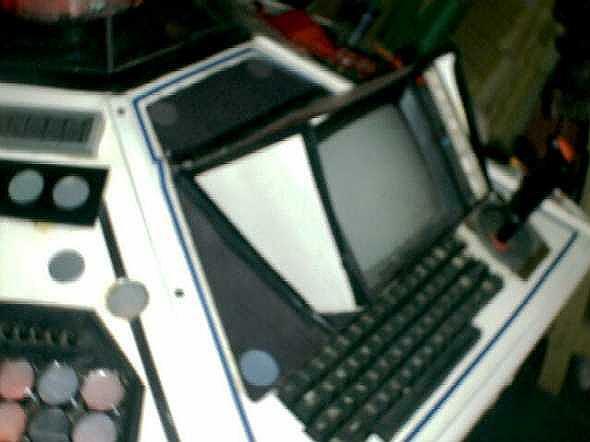 The console is hardwired to two oldstyle keyboards (one from that junked Adam computer) and a 12-key data pad, as well. The Atari used to work, running a compiled Atari Basic program that played sound effects and responded to user input with a simple Eliza-like AI program. At one point, I found some code that used the joystick ports on the computer as I/O lines, activating two external relays, so I could turn on the Rotor motor and other wall lights through the computer. Sadly, years of storage in my basement have corrupted the original program disk, so the main program won't be seen again. Still, I have hopes to one day build a better Console with a PC for the guts, so there is some hope of my writing a new version of the Core software. I have found some articles on the Net about hardwiring switches attached to the printer port that would really be cool, and let Visual Basic control external devices on the Console. Oh well...maybe one day. 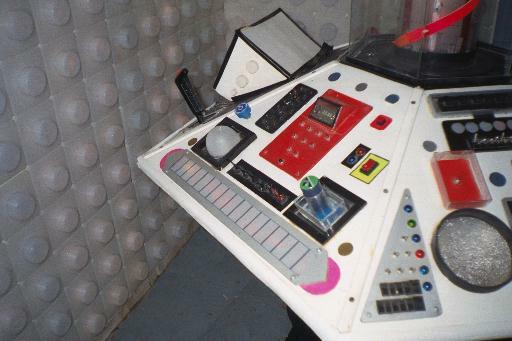 I found that some odd-shaped white plastic inserts that came in the ends of huge industrial paper rolls would nicely mimic the round doohickeys on the walls of the Baker TARDIS control room. I collected 200 or so of them, and mounted them on 4' x 6' plywood panels. At one time, each plastic form had a working Christmas light under it, and rippled in one of eight interesting patterns, but decay claims it all, and only some of those lights survive today. 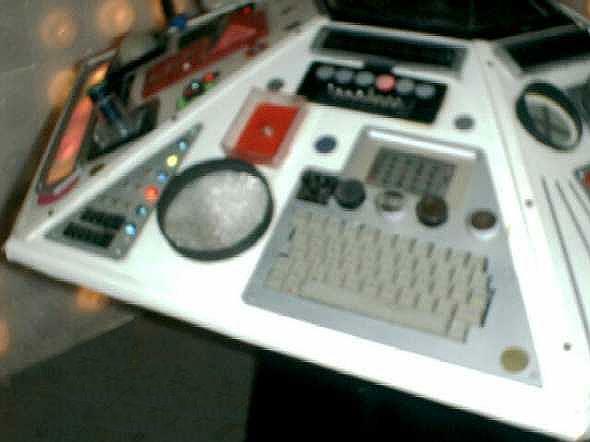 The Console has survived a couple of long-distance trips to Toledo, and one to downtown Cincinnati for a Whovian get together, but that is all the space travel it has seen. What does the future hold? I would love to build a full-scale 6' diameter Console, with full wood construction and a Celron-driven PC under the hood, but life gets busier everyday. If I could really get it working, boy...I would have someplace to put all my junk, and maybe have enough hours in the day to get a good night's sleep! (I tell my friends it does time-travel, but it is only moving forward in time on 1:1 scale, so you can't tell! ;) Maybe I'll find the time. But whatever the future holds, I'm still one of the very few who can honestly say "I've got a time machine in my basement!" If you arrived via the Time Ring, Visit my Homepage! This Doctor Who Time Ring site owned by Andrew Bartmess. URL: http://www.yestercade.net/console/console.htm Love That Email!